if Gulf Recruitments is involved in a merger, acquisition, or sale of all or a portion of its assets, you will be notified via email and/or a prominent notice on our Web site of any change in ownership or uses of this information, as well as any choices you may have regarding this information. You can stop all collection of information by the Application easily by uninstalling the Application. You may use the standard uninstall processes as may be available as part of your mobile device or via the mobile application marketplace or network. You can also request to opt-out via email, at career@gulf-recruitments.com. We do not use the Application to knowingly solicit data from or market to children under the age of 13. If a parent or guardian becomes aware that his or her child has provided us with information without their consent, he or she should contact us at career@gulf-recruitments.com. We will delete such information from our files within a reasonable time. If you have any questions regarding privacy while using the Application, or have questions about our practices, please contact us via email at career@gulf-recruitments.com. All the information on www.gulf-recruitments.com is published in good faith and for general information purpose only. We collect information jobs from various websites in which we don't have control. We do not make any warranties about the completeness, reliability and accuracy of this information provided in our portal. Any action you take upon the information on our website is strictly at your own risk. And we will not be liable for any losses and damages in connection with the use of our website. All the trademarks, trade names, logos or service marks mentioned or used on this site belong to their respective owners. We are using these logos just for information purpose only.If any respective owners of logo/trademark,content etc. doesn't like to see their logo in our website or if it violates copyright norms, please write an e-mail to jobs.gulfrecruitments@gmail.com .We will remove the content, trademark/logo from our website within 2 days. www.gulf-recruitments.com and pages of the same website host advertising and other material submitted to us by third parties. Please note that those advertisers are responsible for ensuring that material submitted for inclusion on www.gulf-recruitments.com complies with all legal requirements. 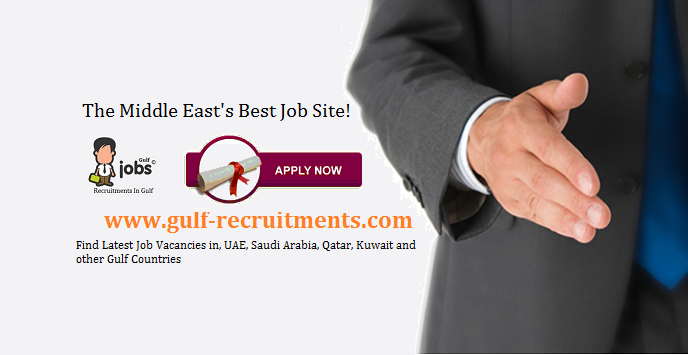 Although acceptance of advertisements on www.gulf-recruitments.com is subject to our terms and conditions which are available on request , we do not accept liability in respect of any advertisements. Google’s use of the DART cookie enables it to serve ads to your users based on their visit to www.gulf-recruitments.com and other sites on the Internet. www.gulf-recruitments.com has no access to or control over these cookies that are used by third-party advertisers.